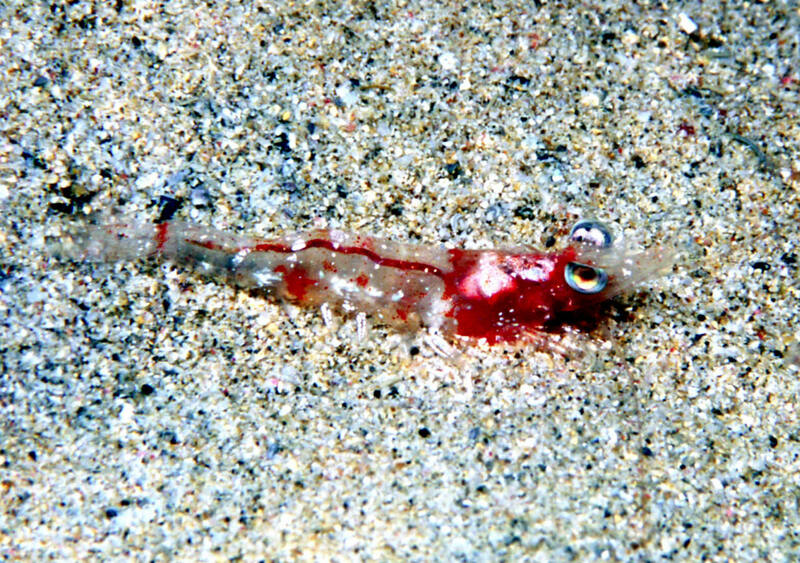 Family Rhynchocinetidae: Dancing Shrimp. Small, reclusive, often seen in large associations, or at least their large reflective eyes, at night on reefs in the wild. Salient distinguishing feature of the family is a foldable rostrum. Do tango-like dance when moving. Trouble with many stinging-celled animals. Eat zoanthids, mushrooms, soft and some hard corals. Do get along with Anemones and Bubble Corals. Rhynchocinetes durbanensis Gordon 1936, the Durban Dancing Shrimp. Indo-West Pacific; Red Sea to the Philippines. Need reef tank conditions, but not with much light, lots of hiding spaces. In the wild live in large associations (dozens to hundreds of individuals) within rocky caves, areas Aquarium and N. Sulawesi pix. The images in this table are linked to large (desktop size) copies. Click on "framed" images to go to the larger size. 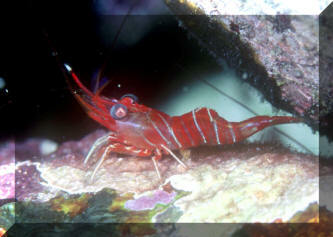 Rhynchocinetes rigens, the Red Night Shrimp. 1 1/4- 2" length. Nocturnal... here tooling around at night in front of Plaza Las Glorias, Cozumel, another burrowing in the sand in Bonaire at night. Undescribed, unknown Rhynchocinetes species... there are several. Here are two, one in Fiji, the other in the Red Sea, both at night. Cinetorhynchus hendersoni, Henderson's Hinge-Beak Shrimp. To 2.5 cm. Pacific; Japan to Columbia. PhilS pic in PNG. Cinetorhynchus hiatti (Holthus & Hayashi 1967), Hiatt's Hinge-Beak Shrimp. Found in shallow, rocky areas of the Indo-Pacific. Kailua, Hawai'i night pic.